The HP Multi Jet Fusion technology has now been available on our online 3D printing service for a few months, with a major success among our customers. Why is it so popular? It allows the creation of great plastic parts using HP MJF PA12, a black plastic with a relatively smooth surface. It can be used for prototyping, but not only. It’s also a very interesting 3D printing technology for the production of finished products. For instance, discover in this post how Gabriel Boutin, an industrial designer, created its 3D printed bike helmet using only parts manufactured using the Multi Jet Fusion technology and why it was the best choice, both for prototyping and production. To sum it up, Gabriel designed a fully 3D printed helmet, with all of its parts 3D printed using Multi Jet Fusion PA12 black plastic. He ordered all of its parts through our online 3D printing service. Why was 3D printing the best technology for this 3D printed helmet? As Gabriel explained to us, 3D printing was by far the best manufacturing technology for this project. Indeed, it allowed accelerating the whole product development process, which is key when it comes to innovative projects. 3D printing is a much faster prototyping technology than subtractive manufacturing techniques because you need less time to prepare your machines. And it’s usually cheaper. Also, since you can use the same material both for prototyping and for your end-user part, you gain a lot of precious time, reducing the number of needed iterations. Another major advantage of using 3D printing for this 3D printed bike helmet project is that it allows the creation of complex structures that could not be produced with another technique. 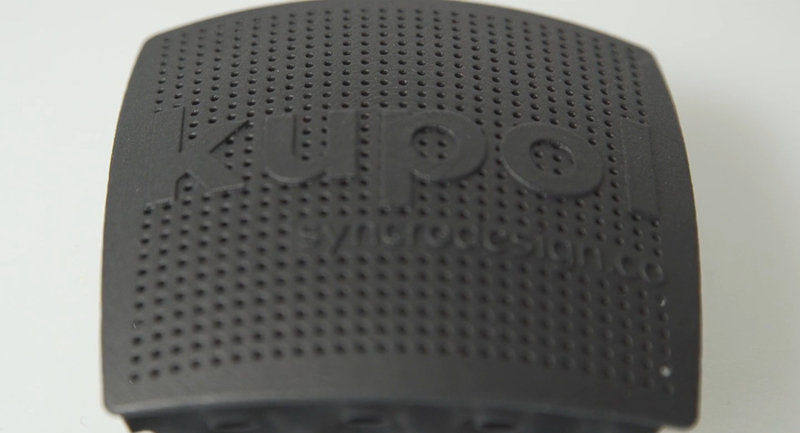 Indeed, the whole concept behind the Kupol project relies on its very innovative structure. Gabriel Boutin wanted to remove the polystyrene foam parts that were not comfortable and that make the user sweat as soon as he starts riding his bike. 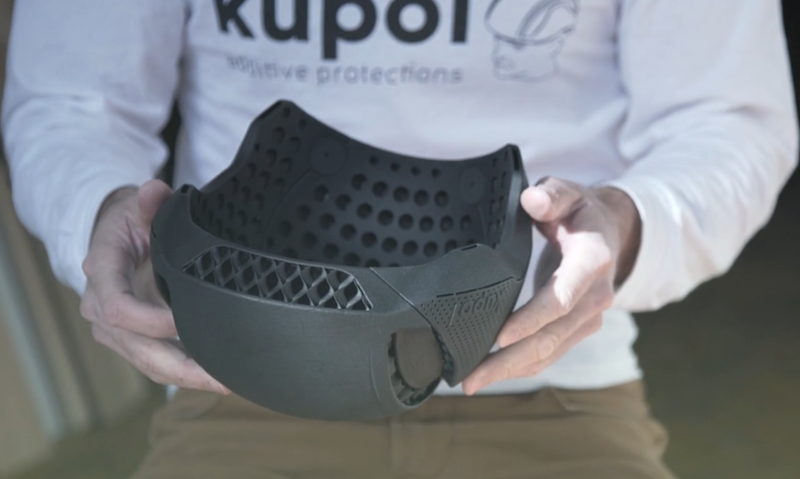 With Kupol’s bike helmet, that’s not the case anymore: the head is kept cold thanks to an innovative plastic structure, which is 3D printed. The whole helmet is hollowed using some patented design patterns that could be compared to lattices. Thus, the whole helmet is really light, and the air can flow in. This would be impossible to realize without 3D printing. Why did Kupol choose to use the Multi Jet Fusion Technology? We know that many of our customers struggle to choose the best 3D printing technology for their project. We helped Gabriel find his way through our large range of technologies, and we soon figured out that HP Multi Jet Fusion was the ideal candidate. Indeed, it allows the creation of high-quality plastic parts in a short lead time. They are robust enough to stand the shocks linked to the use of a bike helmet so that the head is protected. It’s not too heavy, which is essential for this part. Also, this material is not too expensive so it can be used for prototyping. But it can also be used for the production of finished goods since it offers a very good quality surface. Thus, Gabriel could save a lot of time, skipping some steps of the prototyping process due to material testing. 3D printing has been used for a long time as just a prototyping technique, but that’s not the case anymore. Indeed, using additive manufacturing for the production of finished goods is becoming more and more common as the quality of 3D printing materials is strongly increasing year after year. Moreover, the quality of 3D printing finishes is also improving very quickly, which allows the production of parts similar to the ones manufactured with traditional techniques. For instance, at Sculpteo we developed our own patented finish for 3D printed plastic parts, the Smoothing Beautifier finish. Using this process, you can achieve a high-quality surface, perfectly smooth, with a great look. Our brand new Color Resist and Color Touch finishes can also help you achieve a great final result with bright colors, highly-resistant against scratches, abrasion, natural constraints, and time. Thus, you can totally choose them for your finished products projects. Are you wishing to use the HP Multi Jet Fusion technology for your plastic parts? Sculpteo is the best partner for your 3D printing project! Through our online 3D printing service, you can order easily your parts in HP Multi Jet Fusion PA12, a black plastic with good elasticity and high impact resistance. It also has an excellent resistance to chemicals. Moreover, it allows the creation of highly detailed parts thanks to the detailing agent used during the 3D printing process. For a great finished product look, you can use our two brand new 3D printing finishes: Color Touch and Color Resist, both available for Multi Jet Fusion PA12 parts. Ready to get started? Start uploading your 3D design on our online 3D printing service now! Interested in cycling and technology? Discover our 3D printed bike project!